One of my favorite things in making new rules is finding some small inconsequential part of the game and making a whole mechanic out of that. I do it a lot and I usually enjoy the results. In Dungeons and Dragons, there are a lot of opportunities for me to work on small parts. In the 4th edition campaign I run right now, I’ve taken the gods and made them practically NPCs. I wanted to make the gods more involved as I always felt like they were very unimportant. You pick your Primary Deity at 1st level and most characters never think about it again. The PCs gain Favor Points with each Deity individually and can spend them by praying to that god for assistance. But not every god can help in anyway. 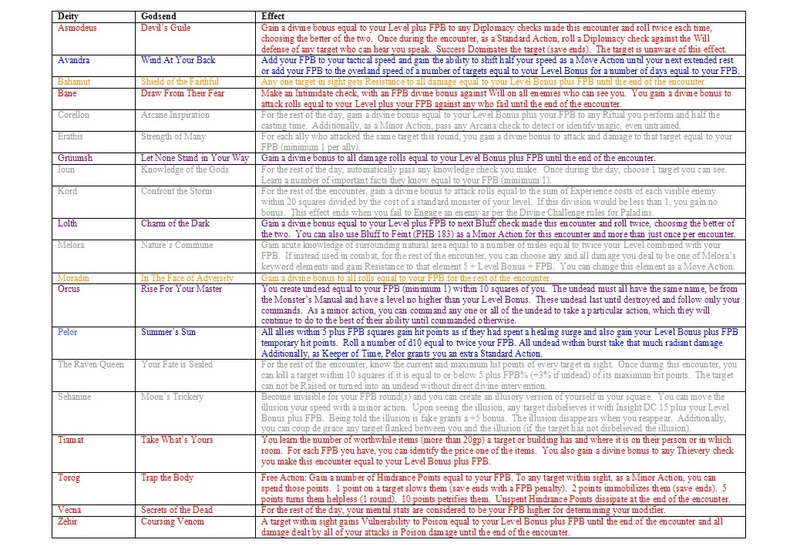 Below is a chart I wrote up laying out how the PCs could spend their FP (favor points) with each god, based on skills, abilities, keywords and alignment to add to their rolls or reroll completely. The PCs keep track of how many points they currently have, as well as how many points they have ever accumulated in their career. If a player has a total of 10 FP then spends 7, they have 3 FP and 10 Accumulated Favor Points. The bottom of the first chart mentions a Godsend. This is a special ability each god possesses and each Godsend manifests differently. The people I play with have come to really enjoy the Divine Favor mechanic. It adds an element of roleplay that everyone enjoys and keeps the PCs in character in an effort to score more FP. Plus, with an added way to reroll a bad roll, it keeps the players in high spirits when they roll a 1 on their favorite daily power. 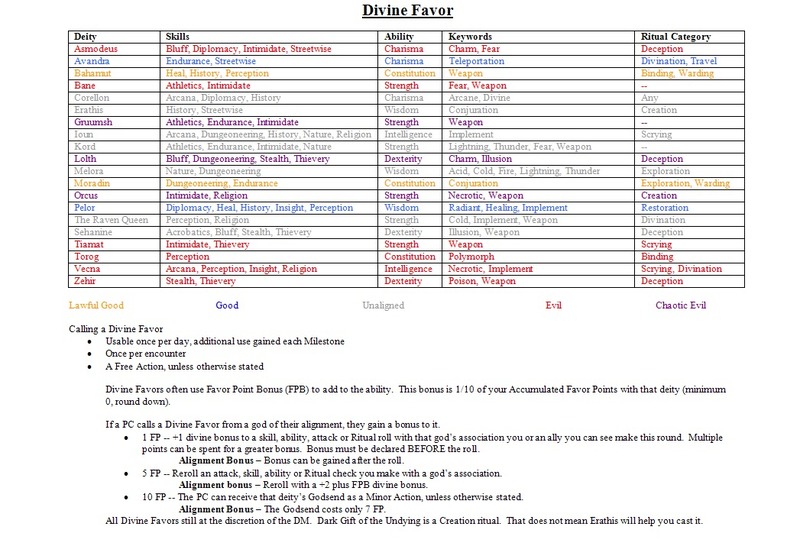 Each PC keeps track of their own FP, so it’s not too difficult on me, as the DM. The only real addition to my work is making ways for the PCs to gain Favor into each quest, although that’s really not that hard. For a while, we played that, at each level gain, the PC would gain 5 FP with their primary deity, but that ended up being too many points, with how often I was handing them out as well. Dropping the automatic points every level, we’ve found a good balance. This mechanic shouldn’t be something the PCs rely on, but rather a back-up to the back-up when something goes very wrong. And it rewards players who stay in character and think as their characters would. For example, the PCs happened upon a subservient zombie which obeyed their orders. Because they accepted it as an ally (or rather pack mule / butler), they gained favor with Vecna and Orcus. If they had chosen to kill it, they would have gained points with The Raven Queen and Pelor instead. I try to make the FP gain based on decisions the characters make, or rewarding good (or evil) deeds. This entry was posted in 4th, deities, divine, dnd, dragons, dungeons, edition, gods, orcus, points. Bookmark the permalink.